Harvest in San Diego County typically starts in August and goes through October or even November -- but only Nature determines when it's harvest time! Every year slight changes in the weather - such as the drought we experienced the last several years, which pushed up harvest 6-8 weeks, or an unusually cool summer that can slow ripening - can significantly affect our harvest date. Just remember, the grapes are ready when the grapes are ready, and you need to be ready! Curds and Wine is here to help you with all of your post-harvest fermentation needs. If you have never made wine from grapes before, our Basic Winemaking Crash Course will set you up with all the basic information you need for a successful fermentation to make outstanding wines - this is our last grape winemaking seminar for 2017! If you don't grow your own grapes and are wondering where to get some, we keep a list of people interested in purchasing grapes and will send you information about any grapes for sale locally - please contact us if you would like to be on this list, or if you have grapes for sale. We are not interested in any monetary benefit from grape sales, we just want to help buyers find growers. Another great source of grapes from around the state of California is West Coast Grapes. They delivery fresh grapes to Curds and Wine once a year - you order directly through their website, see below for more information. Purchase tickets at the shop or online here. The delivery date at Curds and Wine will be set soon, check our Facebook page and Harvest 2017 page for updates. 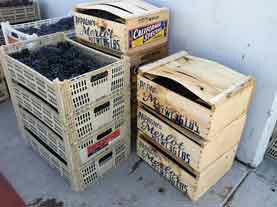 Grapes are unloaded from the refrigerated trucks and stacked next to the order slips at the back of 7188 Clairemont Mesa Blvd, in the same building as Curds and Wine. We cannot give a specific time as orders will be pulled from the truck as they were loaded, but the truck should have most orders unloaded by 11 am - please plan to spend a few hours as it takes time to unload the grapes from the truck. Your patience and cooperation in getting all the orders out before grapes are taken is appreciated! Please send us a copy of your purchase receipts for the drawing;the drawing will be held a week before delivery (we will post the date once delivery is set) and the winner will be announced on our Facebook page and by Twitter. The winner will be notified by email so they can place their order for their bucket of choice out of the available buckets listed on the gift certificate you will be given (choice of merlot, cabernet sauvignon, barbera, sangiovese, zinfandel, syrah, chardonnay, pinot grigio, or sauvignon blanc juice). This bucket of juice will be brought to Curds and Wine with the fresh grape deliveries. Summer Blockbuster Red Special Release - Winexpert Eclipse "Nocturnal"
Nocturnal is a classic blend with an unusual moonlit twist. The grapes were plucked from the vines in the cool of the night when sugar levels are more stable and acid levels are better. This results in a wine with richer flavor and aromatics. Grenache, Syrah, Mourvèdre and Cinsault deliver complex spicy aromas with fruity plum and black raspberry on the palate, balanced with earthy woodsmoke. The full body and lush tannins make the finish just long enough to savor all the nuances in this gorgeous wine. valley in the east to the Spanish border in the south west. Mediterranean climate and fertile soil. A blend of Grenache, Syrah, Mourvedre and Cinsault harvested under the moonlit sky to create a captivating palate of plum, black raspberry and woodsmoke. Like previous Summer red blend special releases, Nocturnal will be around longer than a Limited Edition kit, but will not be here forever. 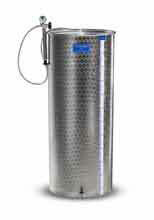 Get yours before they're gone - $189.95, contact us to check availabliity or reserve your kit. Treat yourself to new rich and smokey Toasted Marshmallow with smooth vanilla and decadent caramelized notes. Available now for preorder, these kits will be released at the end of this month so they will be ready for holiday enjoyment and gift-giving. Contact us to reserve your kit! RJ Spagnols Dessert Wines bring unique and distinctive wines that are perfect for all your holiday entertaining and gift giving. Cru Specialty has a wine to please every palate! 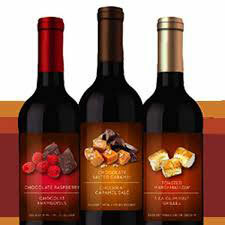 These wines are available exclusively for the holiday season with estimated delivery in September. The August SDAWS meeting is set for Saturday 8/5/17, starting 12 pm until about 2 pm.The meeting will be held at Ramona Ranch Winery, 23578 CA-78, Ramona, CA 92065. Teri will be doing a presentation about the Ramona Valley AVA history. 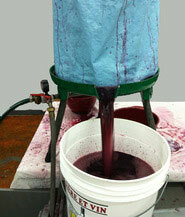 Micole will speak about wine making, current grape issues, and field some questions from us. We cannot bring wine to this event. The winery will provide a tasting at the door, and tastings will be provided for $10.00. SDAWS is planning to have the quarterly meeting to follow at members' properties, so we can resume sharing our own wines. This meeting is set early in August to hopefully not conflict with anyone's harvest plans.